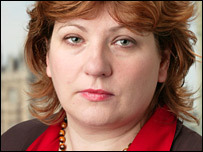 A Labour MP has said that nearly every young person in her north London constituency has been mugged. Islington South MP Emily Thornberry said: "I suspect that hardly any children in Islington have not been mugged at some stage." She said attacks on teenagers by other teenagers are often unreported so do not appear in crime statistics. The Metropolitan Police (Met) denied her allegation, saying it was based on "speculation rather than fact". The Met added that an estimated 1,229 personal robberies took place in the borough of Islington in 2007. Around 61% of those involved victims who were under the age of 18. A Met police spokesman said: "We acknowledge that a large proportion of personal robbery victims are aged under 18 and that just one victim is one too many. "In a borough where there are more than 180,000 residents and many more visitors, we estimate around 750 people aged under 18 reported being victims of muggings in 2007. "This is a small proportion of the overall population." But Ms Thornberry told BBC London attacks on teenagers by other youths often went unreported. "We are less likely to get to get burgled, our cars are less likely to broken into, we are less likely to get robbed on the streets, but there's this unspoken problem which is teenagers robbing other teenagers," she said. "It seems to be an extension of playground bullying. I am appalled they accept this is part of their lives." Ms Thornberry said she would consider going into Islington schools to introduce teenage muggers to young victims, to hear about the effects of their crime.